Millions of United Kingdom nationals and visitors to the British capital will not only see, but ride in a taxi cab with a difference. The St. Kitts Tourism Authority and the Nevis Tourism Authority have launched a joint campaign with the unveiling of a fully branded London Taxi, featuring the warmth and colours of St. Kitts and Nevis, as part of a twelve month promotional advertising campaign in the UK with London Taxi Advertising. 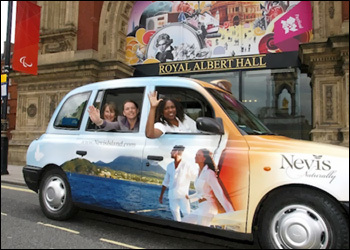 Displaying the eye-catching imagery featured in the recent brand refurbishment of St. Kitts and Nevis, the liveried Taxi has officially taken to the streets of London, to promote and raise awareness of the destination during the all-important London Olympics year and through to 2013. To ensure a fully round Campaign, the driver of the St. Kitts-Nevis Taxi will play a key role as an ambassador for the destination, highlighting both islandsâ€™ attractions to his passengers as they travel around London. Tip-up seats inside the taxi cab will also showcase St. Kitts tourism partners, while the outside of the cab displays the website addresses of both islands. The St. Kitts and Nevis Taxi Campaign will be supported by a number of marketing initiatives during the course of the year, including Caribbean Month in September, St. Kitts Tourism Week in October and during the lead up to World Travel Market.Â It will also be incorporated within travel agent incentives in 2012 and 2013. Supporting the Campaign will be social media activities incorporating My St. Kitts Facebook Page and Twitter, including a â€˜Spot The Taxiâ€™ Competition. St. Kitts and Nevis is currently served twice-weekly on Saturday and Tuesday from London- Gatwick by British Airways, the first scheduled carrier to provide regular airlift to the island. The BA aircraftÂ uses a three class, 280 seat Boeing 777 aircraft holding 40 Club World seats, 24 World Traveller Plus and 216 World Traveller seats.